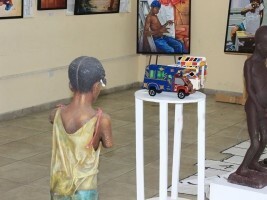 Faithful to its mission of safeguarding the Haitian cultural heritage, the Ministry of Culture, under the leadership of Minister Jean Michel Lapin, supported the 1st Edition of the Festival of Game and Culture "Ann jwe", https://www.icihaiti.com/en/news-25969-icihaiti-culture-1st-edition-of-the-game-festival-an-n-jwe.html from October 31 to November 3, 2018, organized by the Cultural Heritage Conservation Center of Quisqueya University and the Imaginescence Foundation. The objective pursued by the leaders of this Festival of Traditional Haitian Games was to promote creativity and innovation by stimulating the development of companies producing and marketing games and related products. It was also discussed to develop a database to show the evolution and the great diversity of cultural expressions associated with traditional Haitian games and games in general. Exhibitions, panel discussions, musical entertainment, games production workshops were the main activities that took place on the campus of Quisqueya University.